Tinder is any material that is easily combustible; it is the link between the initial spark, flame or ember and the kindling which will ultimately become a fire. There are many materials that you might find as you’re wandering around outdoors that can be used as tinder but they largely fall into a few categories I talk about below. Inner bark tinder is prepared by scraping fibres from the inside of bark removed from standing dead wood. I use a knife to scrape the inner bark away from the outer and then tease the fibres apart with my fingers until it is ‘woolly’. This gives more surface area and makes it easier for the oxygen to get in. Western red cedar is probably my favourite, and whilst not a native tree it is relatively common across the UK. Lime, chestnut, clematis and poplar also produce good inner bark tinder. 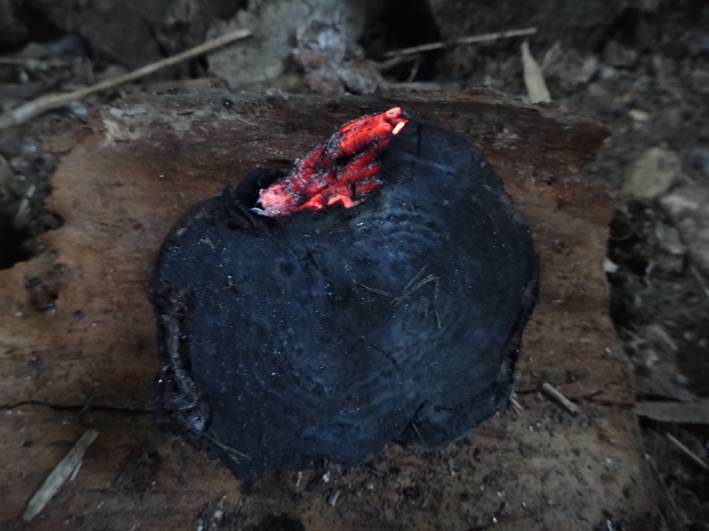 Whilst they will ignite with a spark (with a whole lot of perseverance), I like to use inner bark tinders as a tinder bundle for blowing an ember into flame. Outer bark tinder can be removed from living trees but you need to be careful with some species so as not to wound the tree. 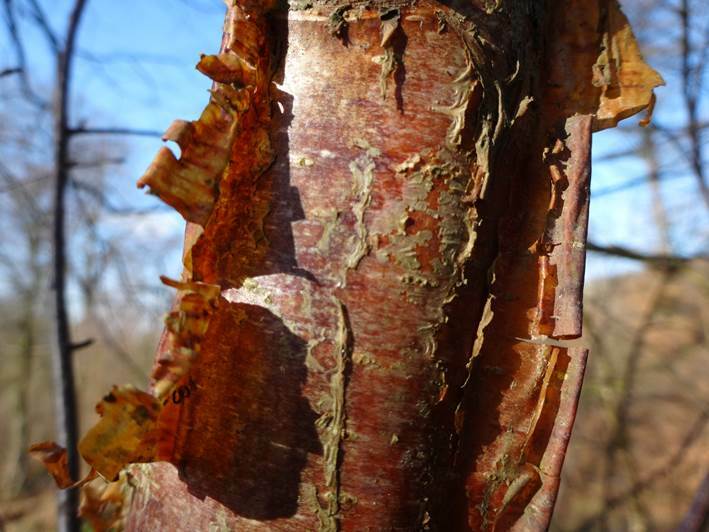 Outer bark tinders can be harvested from birch, clematis and honey suckle. I’ve heard said that cherry works, but I’ve never had much luck. Birch is my absolute favourite natural tinder; I tell students on our courses that I have tinder constipation as I can’t pass a birch! Birch is a really common tree and you should be able to find some easily. 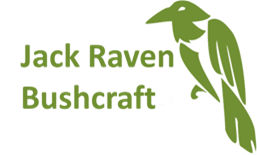 Not only does the outer bark burn fiercely, but the fallen twigs from the birch make excellent kindling; look for really thin purple twigs either under or hanging from birch trees and their neighbours. Recently Bob collected some bark from a standing dead branch on a hornbeam. This was a first for both of us and took a bit of effort. In the end Bob succeeded by scraping a large pile of shavings from his fire steel into the bark and then lighting that. It burnt with a good, hot flame and would certainly be effective for lighting your kindling. I don’t think it would ignite easily with a fire steel that produces low temperature sparks. In my experience downy flower heads generally tend to smoulder rather than produce a decent flame that you can use to get a fire going. For that reason I find that they are probably best used when you are using a tinder bundle to blow an ember into flame, especially if it’s a bit damp. 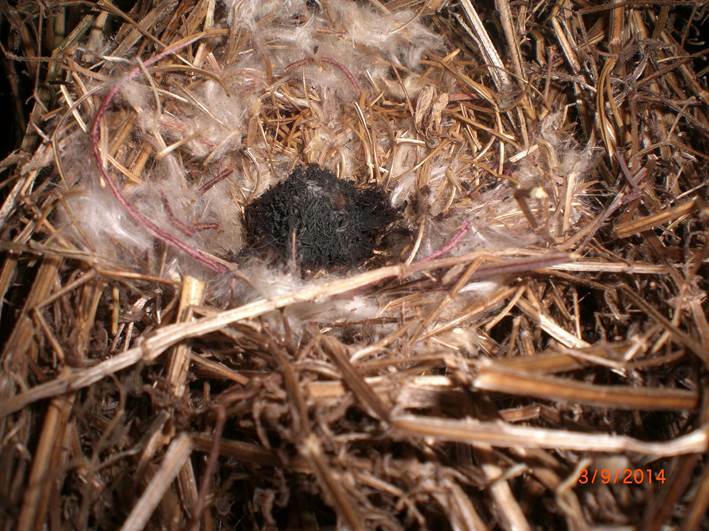 This type of tinder can be collected from clematis, cat tail, thistle, willow herbs and goat willow catkins; my favourite is from rosebay willow herb as you get the downy material mixed with more woody material, which will produce a flame. 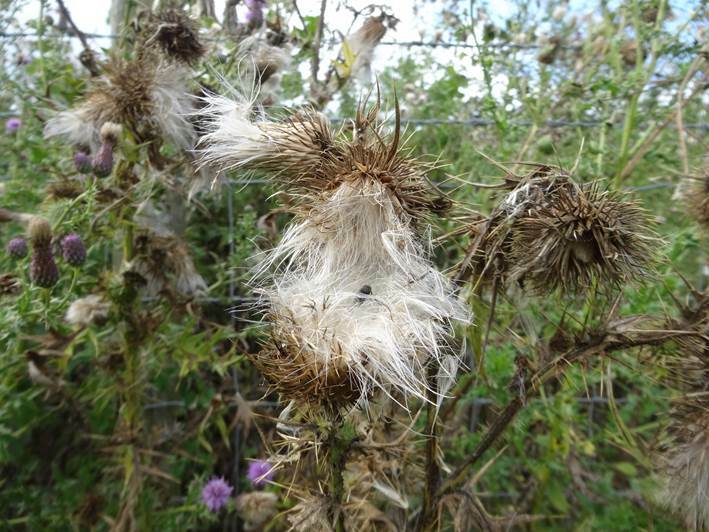 One disadvantage with downy flower heads is that they are seasonal, meaning they’re availability is limited, although rosebay willow herb can hang on to its downy flower heads over the winter if they are in a relatively sheltered spot. There are a few varieties of fungus which can be used as tinder. We find a lot of King Alfred’s Cakes (or crampballs) in our woodland and use them regularly. Whilst the books tell you to look for them on ash, we also get them on beech. Flick them and see if they feel ‘robust’. If they feel hollow or soft, they are probably unusable. They will develop an ember from a spark and can also be used in fire pistons and solar mirrors. They’re also good for transporting a fire from one place to another. More recently I’ve tried birch polypore as a tinder. I charred it first in the same way I would make char cloth. 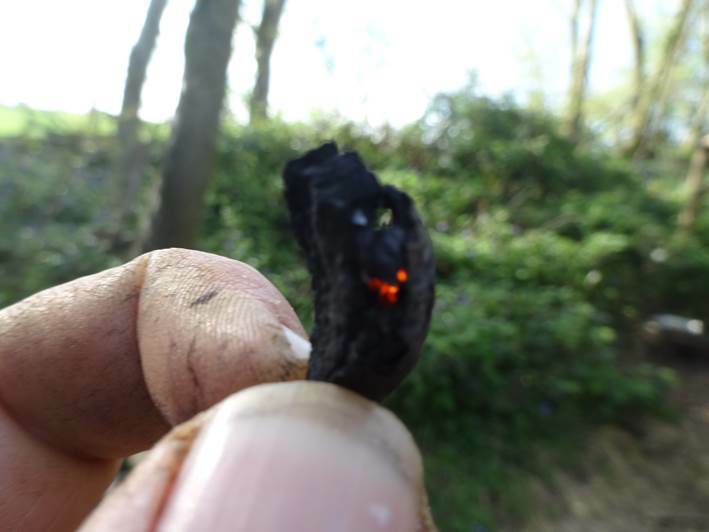 Then I showered the charred birch polypore with sparks and got an ember. It took a lot of blowing to get it to glow. I don’t have any experience to talk of as far as horse hoof fungus is concerned, so I’ll leave you to do your own research on that one. Hay, which is just dried grass, works well as a tinder bundle if you use an ember or char cloth to light it. Cleavers, also known as goose grass or sticky willy, will light from a spark and makes a fantastic tinder bundle, although in my experience it burns away really quickly. Dried bracken will take a spark and also works as a tinder bundle. 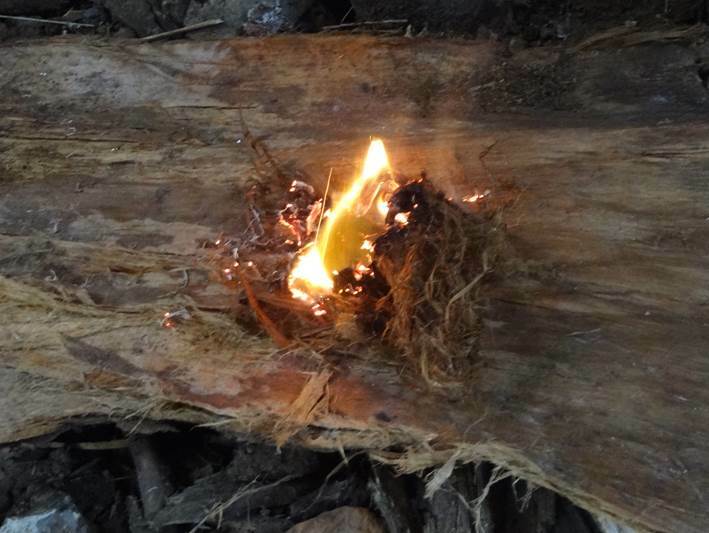 The photo below shows an ember created with an alder hearth board and birch drill. It is sitting on some rosebay willow herb in a cleavers tinder bundle. We got to try out some new natural tinders last year on our trip to the Isle of Arran, you can read about them here. Get in touch if you have any other natural tinders or experiences with any of the ones I’ve listed. 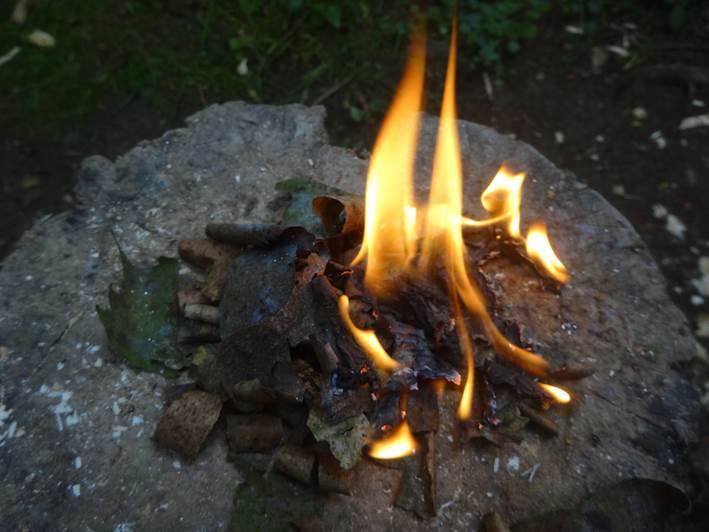 You can look at photos of us using different natural tinders taken during our bushcraft courses on our Facebook page. I’ve written a post about some natural tinders we used on our trip to the Isle of Arran..